This wonderful knife set from Victorinox comes with an in-drawer knife holder made from beautiful beechwood, measuring 17 x 5.75 x 2 inches. The holder holds knife of up to 8.5 inches (blade length). The set comes with the following knives: 3.25" straight edge paring knife, 4.5" utility knife, 7" granton blade santoku knife, 8" carving knife, and a 8.25" bread knife. 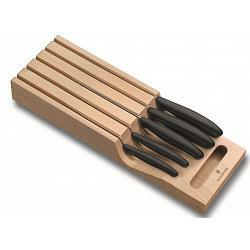 The knife holder set comes in a nice gift, is made in Switzerland, and has a lifetime warranty.